A scanner of customer and passenger IDs designed specifically for installation into self-serve kiosks, e-gates, and other automated acces control terminals or service desks. 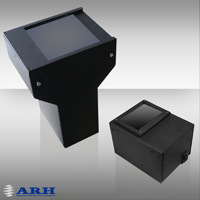 ARH Kiosk readers are designed for various kiosk applications. 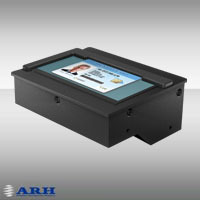 ARH Kiosk Reader ID1 and Kiosk Reader ID2 are compact devices designed to be integrated into kiosks. ARH Kiosk Readers provide optimal solution for scanning ID-1 and ID-2 size cards like national ID cards, driver's licenses, health insurance cards, visitor badges, etc. ARH's industry leader OCR algorithm is included in the attached SDK. It ensures exceptionally high reading rate of ICAO standard OCR lines. By using user defined OCR functions (part of the SDK) it is possible to read the VIZ fields also. Optionally UV illumination is available to serve document authenticating applications. Kiosk Reader ID1 can be operated from USB power, therefore it can be used as portable card scanner.